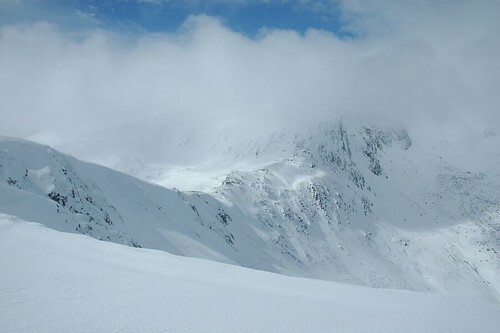 We were into April but winter had returned with a bite and laid some fairly deep snow in parts of Scotland. I headed out toward Braemar and parked up at Invercauld bridge. I used my bike to shorten the time taken to get up Gleann an t-Slugain. It wasn't an easy ride with the strong wind and the up hill aspect of the track. After an hour it was time to leave the bike in the heather and head up through the fairy glen. After a short climb the path disappeared under the snow and it was time to make my own way. 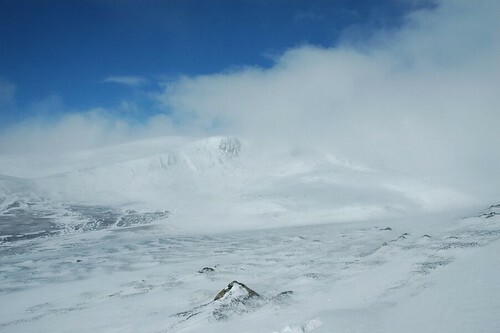 The wind was blowing low cloud over the huge bulk of Beinn a' Bhuird sitting some distance ahead. Loose snow was being swept off the ground adding to the wintry atmosphere. I headed north for kilometre or so before heading up Carn Eag Dhiubh and then onto the col between Creag an Dail Mhor and Carn Eas. 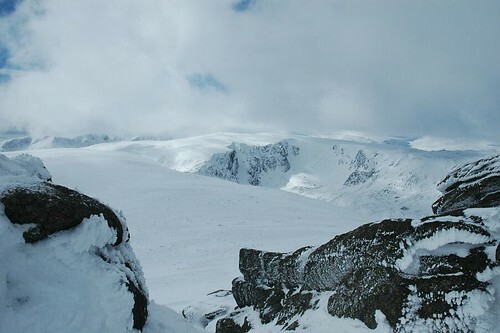 The snow was banked up fairly deep and I was in above my knees as the slopes steepened toward Carn Eas. I eventually broke out onto the plateau of Ben Avon and the mist that covered it. 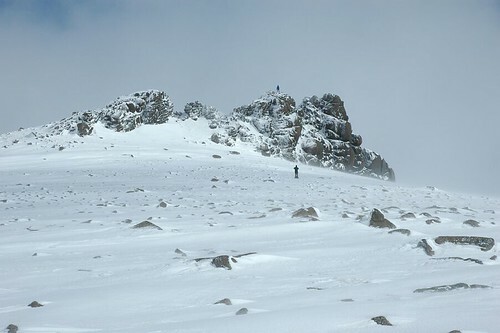 Following compass bearings I headed towards the summit keeping a watchful look out for the drop off and cliffs that lie to the north. The mist lifted allowing me to confirm my position and allowing a view across to Beinn a' Bhuird. Up ahead two walkers approached the summit tor, one stopping to photograph his companion as he gained the top. After a welcome break and a bite to eat I headed off toward the Sneck and across to Beinn a' Bhuird. 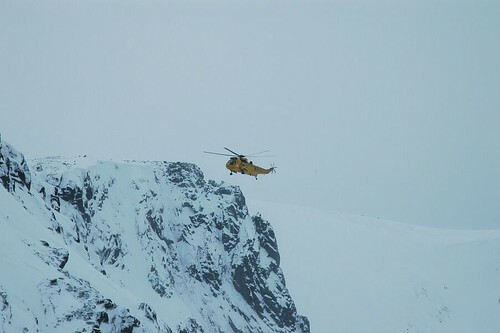 An RAF helicopter appeared, spending some time hovering around the cliffs above Garbh Choire. My two fellow walkers had also stopped to watch as the helicopter circled a couple of times before heading off with a wave as they passed near our vantage point. The mist again descended as we started to cross the flat upper reaches of Beinn a' Bhuird toward its North top. We made the top signified by a a few ice and snow topped stones making up the cairn. 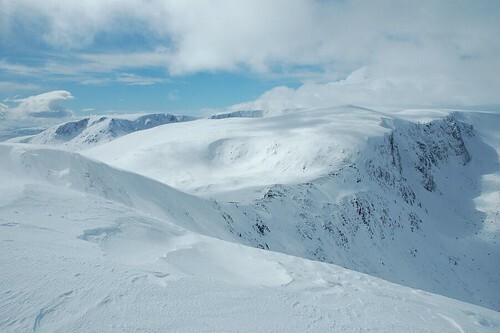 We then traversed well to the west to ensure that our route south would avoid the cliffs surrounding Coire nan clach and Dubh Lochan and keep them on our eastern side. After we regained the low ground my companions offered me a cup of tea but as time was getting on I had to decline. The outward bike journey was much quicker than that of the way in and I arrived back at the car park just before dark.